The Maclaren Beatles Yellow Submarine Stroller – Review and Giveaway | DaDa Rocks! I’m a mega-super mega fan of The Beatles, I grew up listening to their music… I grew up going to their concerts (well the remaining beatles that is…) there wasn’t anything in the baby market of strollers that really was cool for Dad until I saw this… When the Maclaren first released the Beatles Yellow Submarine stroller [Amazon] I was drooling… I had an older Maclaren, that I put it through hell – I mean this stroller was abused – we took it around to EVO Conference in Salt Lake, to Texas, to Florida, to over place we drove – its still around being no worst for the wear. So when I got this stroller and said go test it… I was like a kid in the candy store – I beat on this stroller beyond the normal use… Its even become the stroller I’ve used this winter pushing in to snow banks, sheets of ice and its still awesome! First the design is amazing! You can see this stroller from across the room, I get compliments on this stroller all the time – its that pretty. Plus its SUPER Light weight. Running down the basics it has a five-point safety harness, lockable front swivel wheels and linked parking brakes. Its built on the Quest frame, features include the convenience of the one handed compact umbrella fold with carry strap (awesome for airplane trips) and a carry handle, a four-position recline, hand mesh shopping basket, height adjustable shoulder harness (so it can grow with your child). It comes with a specialty printed raincover and the hood is water resistant plus it comes with an great psychedelic-print seat liner thats reversible. As an add on there is a foot muff [Amazon]. This stroller is a great option for babies three months (need that stable neck) to 55 lbs. Another factor when buying a stroller beyond weight and function is going to be the warranty and all Maclaren Buggys are backed by their world-class engineering and the industry’s first Sovereign Lifetime Warranty. Which to date I haven’t had to use… really I’ve beat this stroller up… and its gone everywhere my child has in the last 3 months. One thing that I do want to bring up is that this stroller has the redesigned hinge which is now rounded so you dont have to worry about that recall or about hinge covers. So while this looks like it’ll be daddy’s stroller one of the best parts is how light weight it is coming in at just 12 lbs my wife is usually carrying it up and down subways steps with no trouble at all. How to win it… Contest ends 11:59pm EST. February 22nd, 2011. @maclarenNA #Beatles Stroller @dadarocks – http://dad.tc/enxY3H and you must also comment with the link to your twitter message. Disclaimer: Thanks to Maclaren for the prize for this raffle. It’s also limited to the USA too. 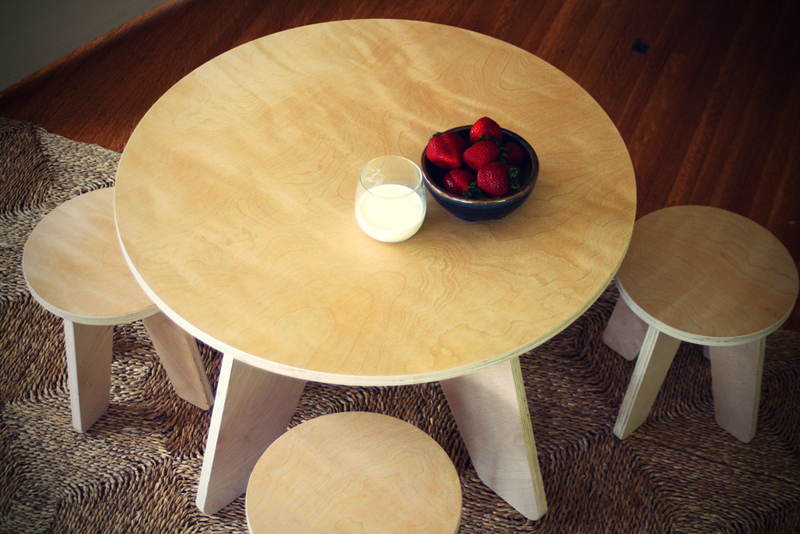 Sodura Table and Stools pick up a set for kids – want one? This stroller is cool because its named after one of the best bands of ALL time!! Love the colors also! Oooh, like you, I am a ginormous Beatles fan! My 11 year old even watches Help! with me. I love the little submarines – so fun! First, all the Maclarens are cool; but I love how they design them through a theme! Great idea! This one is way unique! I follow you on Twitter (@mommylok)! I am a Fan of Maclaren on FB! I think this stroller is cool first the name and second the design is Awesome! I think this stroller is cool because it has a hot design. I mean who doesn’t like the Beatles and the yellow submarine design is versatile for both boys & girls. I am a fan on Facebook and I left a comment Cindy C.
I am a fan of macclarenbaby on Facebook and left a comment that DaDa Rocks sent me. Cindy C.
Wow that stroller is really awesome. I never had a good lightweight stroller for my daughter, we tried so many. I read that you could even stroll this in the snow in the city! This would be perfect to take my new little guy around in on shorter trips as soon as he can hold his head up! I love how Super lightweight, folds easily, carrying handle,hood is water resistant! It seems to have it all! Also, its yellow, which is my favorite color and blue which Bob loves! I think this stroller is cool for all the reasons you described above! I like you on FB! I left a comment on the wall! Fan of maclaren on facebook! I left a comment! Are you blind…just look at it. It is the epitome of cool. It is a Beatles inspired Maclaren Stroller. I am drooling and so is the tot. We would love to own this stroller…and by love I mean stare at it for hours and give it hugs. Well i’m too young for the Beatles but I do know I love maclaren strollers. They fold small, last forever and are lightweight enough to carry on and off NYC subways. The carry strap is really handy, it comes standard with a raincover, it’s comfortable both for a baby and my 3 year olds, the stroller liner makes cleanup a breeze… whats not to like about it? Oh and I love denim so the hood is extra cool, especially the way it stands out agains the yellow. this stroller is cool because it is yellow like the submarine and the seat material looks like waves. and because I really need a new stroller !! And he sailed the sea of green, in his yellow submarine, Submarine! I can remember as a kid being placed in front of the TV to watch Yellow Submarine….what a great movie and cartoon. As long as you avoid the Blue Meanies, this is a great stroller to safely transport the little ones through Pepperland! I like the style and safety features. Truly a stroller that a Dad can proudly push. Now if they’d only make the mini-van cool, too. Honda presents The Beatles “Sgt. Pepper’s Lonely Hearts Club Van, ” anyone? I know I’d line up for that! I [email protected] on Twitter! I subscribe to your Feedburner digest mailing. I’m a friend on Google Connect. I follow you & @maclarenNA on Twitter, and subscribed to your blog by e-mail ([email protected]). We’re looking for a good stroller for NYC for our 14 mo. old son (who has the same first name as your son’s!). Your description of this beautiful Maclaren sounds like it’s just the ticket! Ummm. A Beatles stroller? Seriously? The Nut’s grandpa will gladly fly up from Tennessee to push her around Queens in that beauty. Amazing!!! This stroller is awesome because of it’s celebration of the Beatles! We also love the colors! I like you on FAcebook and I commented on your wall. l like Maclaren on Facebook and I wrote on the wall that I enjoyed your review! I love this stroller because its more like a daddy stroller and lightweight! 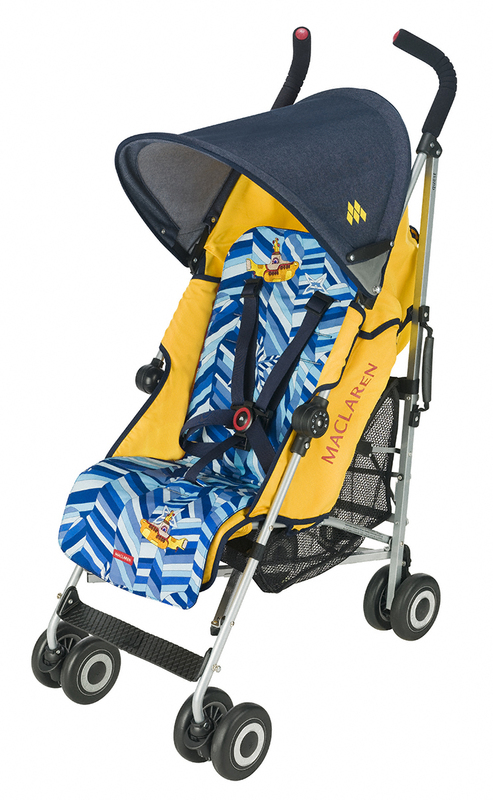 The Beatles Yellow Submarine stroller from Maclaren is cool because first of all it is a Maclaren, and then to be associated with the Beatles sooo cool!! Strolling the NYC streets with the Wee one in that Beauty…Priceless!!! @mommylok follows @MaclarenNA on Twitter! IN Love with yellow submarine. Classic song and this is a great stroller! I’d love to win the Mac Yellow Sub stroller as it is just so cool-looking. What kid would not want to ride in it, what parent would not want to push it? I follow MaclarenNA on twitter. Fanned both you and Maclaren on Facebook! I need this not only because our stroller is ugly and has a bad wheel so it makes weird noises on the sidewalk, but because we’re teaching our daughter to appreceiate good music, starting with the Beatles. Her father in law passed a couple months before she was born and was a HUGE Beatles fan, so we feel it’s our duty to make her a fan as well! What could be cooler that singing “We all live in a yellow submarine…” as you stroll the little one around! I wanted to log on via facebook but it didn’t work for me. I have liked dadarocks. I wanted to log on via facebook but it didn’t work for me. I am a fan of maclarenbaby. I have joined the Google community as Willyn “Jay” Bandoy. As a soon-to-be father, it would be an honor to represent the Beatles-inspired baby stroller Maclaren. My little sweet potato growing in my baby’s momma will get a chance to listen to wonderful Beatles music during prenatal and hopefully get to ride in a yellow submarine stroller. Contact me on twitter @WBandoy. Thank you! I love the fun colors of this stroller. My husband would LOVE the fact that it is inspired by the Beatles! Thanks for such a great giveaway! It’s cool because it only weighs 12 lbs. TWELVE lbs people. Most strollers are so heavy and hard to transport. SHUT UP!!!! We need this!!!! The Boss took his George Guitar to bed with him tonight. Yes, a small replica of George’s Gretsh that we got at the Beatles festival!!! He would freak over this. Especially when we put his new baby brother in it. The one who is due on Paul McCartney’s birthday. i die for this stroller! my husband is in the music industry and he would love to push this around the mall. Such a great stroller you will never get confused which is yours. I like you on Facebook. And in real life too. I’m dying to get the stroller!! My husband and I are huge Beatles fans and plan to name our child Lennon! We even had a “Beatles” wedding! !